Bali Elephant Ride adventure located between the rice paddies and Jungle, enjoy ride the elephants on teak chair like a king. All Elephants are coming from Sumatra. We are from tourism side would like to try our best to conserve this magnificent species by creating an adventure in Bali. All elephants are coming from Sumatra, we are from tourism side would like to try our best to conserve this magnificent species by creating an adventure in Bali. 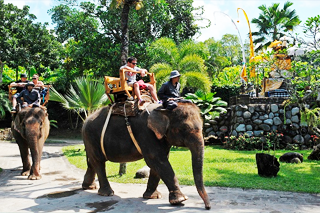 Enjoy ride the elephant fro 30 minutes ride with professional elephants guide in the parks. Ubud Monkey Forest is small forest with monkey habitat and is very easy to find this place since it is located in the hearth of Ubud Village and it is just about 1 hour drive from Denpasar Town. The monkeys that live in this sanctuary are called Balinese macaques, also known as long tail macaques. Their scientific name is macaca fascicularis and aside from humans, macaques are the most widespread and successful of all primates. 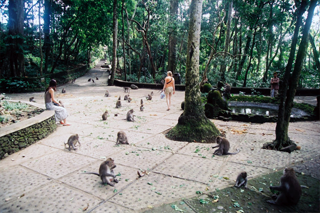 About 300 macaques currently reside in the monkey forest. Ubud Royal Palace is a residential house of Ubud king which is more known by the name of Puri Saren. In this Ubud palace, the Ubud king is leaving with his family and makes this palace as govermence center in the empire era. The houses are very beautiful with the strong Balinese ornaments and decorations that make it an ideal place to visit. 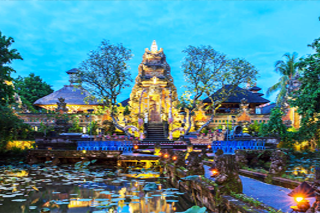 Ubud has been a "royal town" for over a hundred years. Its princes, who bear the title "Tjokorda" or "Agung" still live in traditional palaces, called "Puris". 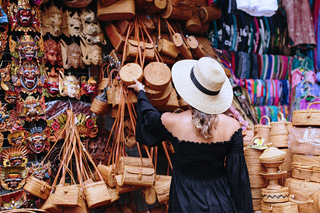 Ubud Market is the traditional markets in the center of Ubud Town and opposite with Ubud royal palace. Ubud Market is unfolding from west to easterly divided become two group with different purpose. There are two markets available at the same area those are one block at the Westside is for a traditional artistic market and another block located in the east as an everyday traditional fundamental market requirement. Ubud Market is opened every day about at 08:00 until 18:00, even some from them still open until nighttime.